Mother’s Day Wishes I’m Here! Yup, it’s true. 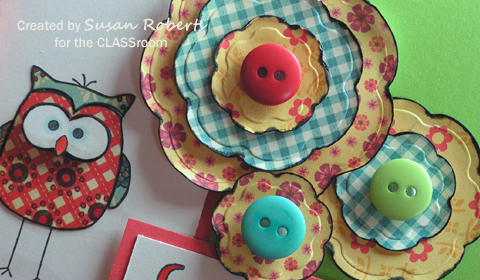 I do love paper and have been playing with some yummy designer ones over in the CLASSroom. Hope you can stop on by. Great samples. Love the sanding of the embossed panel. I’m DP challenged but slowly getting into it a bit more. Just don’t ask me to have more than one DP on a card LOL! Loved all 3 cards on Classroom. Outlining the die cut pieces is such a great idea. Thanks for that tip plus others. Great guy card, love the texture and cool stamp, on the second the paper piecing is really neat, and I love how you highlighted the words in the 3rd card, love the papers too! Really like the cute owl and the way how you paper pieced him. Love your idea with the black marker too! Layered flowers look so pretty! And graduation card is a masterpiece! Little diploma stole my heart, love it!!! Really like the embellishment and layered borders! Thank you so much for sharing with us, Susan! Love visiting Classroom with you as a teacher! Oh my gosh, look at those flowers!!! I’m off to take a look at the classroom. You definitely had fun in the classrom. Oh my gosh those samples were awesome!!! And the tutorial is fabulous too. Thanks Susan. Oh my gosh…I must check this out! Too cute, Susan!! Love the look of these!! Those flowers are totally gorgeous!!! How cute! Paper is a great weakness of mine as well.